007 Style: Sir Roger Moore Style Tips: As the world mourns the loss of Sir Roger Moore, it is best to remember that he lives on in the iconic fashion statements he made. Here are 4 simple ways to amp up your wardrobe all while maintaining that suave 007 look. Wide legged pants? Make sure you have a wide lapel on your suit jacket. Slim cut pants? Slim fit jacket with a more subdued lapel. Having even proportions throughout your outfit is the key to looking slim and filled out. Do yourself a favor next time you are out shopping and buy a print that speaks to you the most. Having a bold print is an immediate upgrade to your closet. Whether you pick plaid, stripes, polka dots or even houndstooth, you will be unique in a crowd. Moore was never afraid to be bold. Often called the “warm weather neck wear”, a bow tie adds a smidge of quirkiness to a formal look. Moore’s Bond is always ready to complete a mission or order a martini in his bow tie. One of the most famous photos of Moore is of him in his white tuxedo jacket. He pulls it off brilliantly all with an air of sophistication. Although menswear has come a long way in terms of color and print options, it still has room to grow. Channeling your inner Roger Moore doesn’t necessarily mean purchasing a white suit. Sky blue or mint are other bold options available. With these four tips, you’ll be walking around in style in no time. A local shrine in Arimatsu village is seen here. This humble town is the birthplace of Shibori Dyeing. Arimatsu village is one of Japan’s hidden treasures, whose history never seems too far from the past. The town is the birthplace and probably best known for its traditional textile craft, Shibori, used for kimono and various designer garments today. “The whole town is really beautiful. People here live and breath their Shibori craft,” explains Sebastian, whose textile affections inspired his trip. It’s like a living museum - people still live here, and the town is filled with contemporary designer boutiques and modern local bistro and cafes. You can also enjoy the scenery of the village’s serene Zen forest anytime of the day. Arimatsu (有松町 Arimatsu-chō) was a town located in Aichi Prefecture, Japan. Today, it is approximately three-and-a-half-hours by Shinkansen (新幹線) from Tokyo. It is now part of Nagoya, a town filled with Tokugawa and Edo treasures. Shibori, also known as “Japanese tie-dye”, is a form of resist dyeing in which fabric is folded, tied, twisted or wrapped to create patterns and various motifs. The variation of methodology and motifs it has created are given different names and each has symbolic significance. One of the main attractions to learn and experience Shibori in Arimatsu is the Shibori Kaikan Museum. The true treasure is on the second floor where you’ll see the Shibori Craftswomen from Arimatsu. “I was introduced to Okasan Aiko during my visit where she demonstrated the different Shibori techniques. She showed me the different processes of Shibori from Kanako (regular tie-dye), Kumo (wrapping), Nui (stitching), Arashi (pole wrapping and twisting), Itajime (shape resistant/clamping) and many more Shibori techniques. The Shibori collection displayed is breathtaking, most of them dyed with the natural and traditional dye – Indigo or Japanese Blue. Shibori fabric has an amazing texture. The tiny knots that are hand tied not only create a visual pattern, but also a raised texture. The tools and vintage technology varies within the different processes of Shibori. Workshops are held where various techniques are taught by the Master Shibori craftswomen,” explains Sebastian. As Master Aiko continued wrapping her Kumo Shibori, she talked about the Annual Shibori festival, a celebration of the Shibori art and the town itself, held the first weekend of June along the old Tokaido highway. The festival floats with performances of Dashi floats and Karakui mechanical puppet shows performed by Shibori Komachi and Fukuotoko (lucky men). Some of the old historical houses are open to public offering a peek into truly traditional homes. Many old historical houses from the Edo period still line the Tokaido road. Shibori designer boutiques, cafes and serene local shrines could be found in the backyard of Arimatsu village. The vivid art of Shibori is truly a cultural experience beyond time and history, and today, placing its mark on contemporary fashion. Experience Shibori within Faburiq’s haberdasheries and shop the story! *If you would like to know more about Kimono fabrics click here and if you would like to know more about Shibori fabrics click here. Weaving is a method of fabric production in which two distinct sets of yarns or threads are interlaced at right angles to form a fabric or cloth. This year, our team was fortunate enough to visit the Nishijin district of Kyoto and acquired a thorough understanding of the technique and origin of the Nishijin weave. We are very excited to begin including this lavish fabric in our upcoming collections. Nishijin is a district in Kamigyō-ku, Kyoto, Japan, and (by extension) a traditional textile produced there and famous for Nishijin weaving, more narrowly referred to as Nishijin-ori (Nishijin fabric). Nishijin is Kyoto’s traditional textile center, the source of all those dazzling kimono fabrics and obi (kimono sashes) that you see being paraded about town. Nishijin produces the most sophisticated and lavish Obi you will find in Japan. A stunning Geisha's Obi in Kyoto. The beautiful fabrics woven in the Nishijin district are seen as a symbol of Kyoto and developed over 1,000 years alongside Kyoto's history as the former capital of Japan. Nishijin-ori‘s origins are from an ancient Japanese family, the powerful Hata clan, who immigrated to Kyoto from China around the 5th-6th century. Settling in the Uzumasa district of west Kyoto, they introduced silkworms and the manufacture of silk textiles to the local people. By the 8th century, the royal court had created an official branch to supervise the textile artists and their production. In other words, these were state-owned textile operations. In the 15th century, Kyoto suffered a long period of civil war, the Onin War, between the East and the West, and many artisans fled Kyoto to places such as the town of Sakai, south of Osaka. When the conflict finally ended, the weavers returned to Kyoto to resume their craft. One group of artisans settled on the site where the western army had been camped during the war. This is the origin of the name 'Nishijin,' which means west position. Nishijin’s literal translation is the West fort. Since then, the name has been used for the method of weaving to create designs and patterns using dyed threads in Kyoto. Supported by the patronage of both the Imperial court and great samurai lords, the weavers continued to adopt new technology. By the early Edo Period (1603 to 1867), there were some 7,000 looms crammed into an area of 1.6 square kilometers. A combination of disastrous harvests at the end of the 18th century with Japan's capital move from Kyoto to Tokyo in 1869, Nishijin weaving seemed threatened with extinction. But the Nishijin weavers showed an amazing resilience and spirit in preserving their craft. Observers were sent to Europe to study the textile industry there, and advanced Western weaving technology and equipment were introduced from France and Austria, such as the jacquard loom and the flying shuttle. By the 1890's, only 20 years after the shift of the capital, the Nishijin weavers had fully adapted modern technology to their ancient art. By adopting modern technology with their age-old craft, the Nishijin weavers were able to create a stable business in inexpensive machine-woven fabrics for everyday use that supported the production of the elaborate and luxurious hand-woven fabrics that are the purest expression of the Nishijin style. Nishijin Obi comes in many colors, including gold, and it is glamorously thick and rich, not to mention quite heavy as well. Nishijin Obi is rather expensive items, but one is enough to last for a lifetime. Their quality and craftsmanship are remarkable and orders from famous couture designers around the world are not uncommon. The Nishijin style of weaving uses yarn dyeing, in which yarns of various colors are woven to make patterns. This technique is both time-consuming and labor intensive compared to other techniques, but it is indispensable for creating the elaborate and beautiful hand-woven kimono fabric. Contemporary designs utilizing the Nishijin Weave is popular amongst couture designers. Today, the clacking of looms can be heard all around the Nishijin area. The vitality of this district is a testament to the pride and dedication of Nishijin weavers through the ages and the important place that Nishijin occupies in the hearts of Kyoto people. Massachusetts College of Art and Design showcases the work of Fashion Design students in its annual fashion show with designs from seniors, juniors and sophomores presented in a formal runway show. Now in it's third year, the goal is to provide a full-tuition scholarship to a deserving and exceptional Fashion Design student. This year, Faburiq is thrilled and honored to be involved in making the annual Pre-Fashion Show Party and runway show a tremendous success. 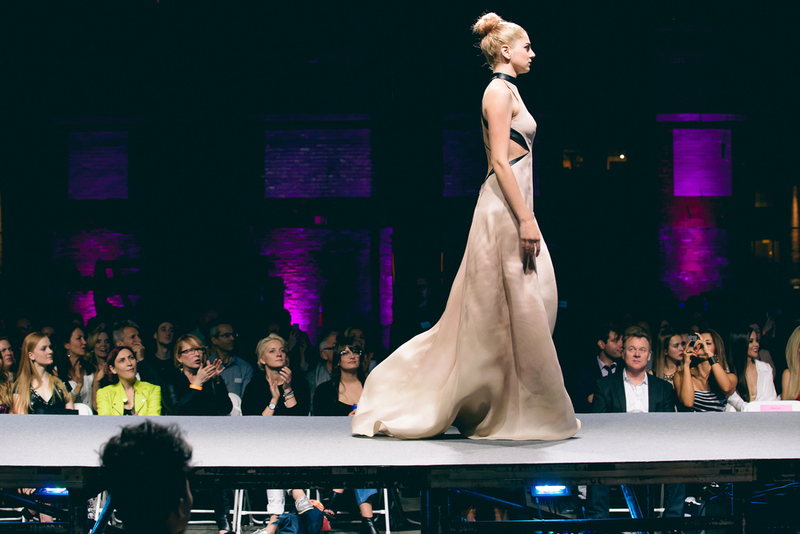 The 2016 MassArt Fashion Show Party surpassed its goal and MassArt was able to award a full tuition scholarship to an exceptional and deserving Fashion Design student. Founded in 1873, MassArt has a legacy of leadership as the only independent public college of art and design in the country and the nation’s first art school to grant a degree. Since 1907 MassArt’s Fashion Design Department has been devoted to the essence of educating fashion and textile designers with a unique message and compelling vision for the industry. The fashion we witnessed that evening exemplified artistic excellence, intellectual creativity and entrepreneurship. All the collections embodied a certain design viewpoint that was unique and visionary. Here are some of our favorite pieces of the night! By supporting an institution such as MassArt, we at Faburiq felt that it was a testament to the solid work of artists, designers and craftsmen the world over and that creative thinkers and makers are not only economic generators, their contributions to the creative economy continuously changes the world from past to the present. This is by far one of the best illustrations for the Modern Derby Gentleman we have come across so far. We possess an unparalleled color palette here at Faburiq and to us the accessories make the outfit. Vibrant Kimono accessories against classic Derby tradition. It can't get better than this. Starting with the pants, whether you are aiming for a smart or casual aesthetic, it should always be an eye-catcher as long as it pairs well with the right shirt and blazer. A great dress shirt in a complimentary color will go a long way. Don't shy away from gingham, striped or even a floral shirt to turn it up. Some gents even have monograms on all their shirts like my better half! The jacket is what brings everything together. If you want a polished look, a classic navy or seersucker blazer is always in style. If you want to have a little more fun, a nice chalk stripe or windowpane suit will certainly make heads turn. We recommend sporting the 3- button side vent for a more polished look but this is more of a personal preference. Next is the tie, the little detail that counts. Most gentlemen wear a necktie, but a bow tie is always an appreciable option. If you never wear bows, try it out and you may like it. Watching the Derby wouldn't be the same without our bowties! For gents that rock pocket squares, the purpose of the pocket square is to complement the rest of your look: either by harmonizing or contrasting with your other accessories. If your tie has a pattern or print, then choose a color from that palette to bring your ensemble together through your pocket square. Equally, you could choose a pocket square that is a shade lighter or darker than the core color of your ensemble. Don’t be shy to bring out an accent color on a subtle pinstripe or checked shirt, it's all in the details. Alternatively, if you want to make your pocket square the focal point of your look, you could opt to clash your pocket square with your tie and, of course, the rest of your outfit. With this, it really is a case of ‘the bolder the better’: experiment with vibrant colors and eclectic prints from our wide selection of Kimono Pocket Squares. For shoes, the most important thing you need to know is that they should be worn sockless. Top it all off with a fedora or bowler hat for that Kentucky Derby look. Men's Derby hats are generally solid in color and inspired by styles from the 1920s. Now that you've tied on a bowtie with a bourbon in hand, be confident in your Derby outfit. No matter what you wear, it’s how you wear it Gentlemen! Seen below is one of our favorite Derby ensembles: A Green Windowpane Blazer Jacket paired with the Mocha Kame Bow Tie and Beige Hana Pocket Square. On the left is the Red and White Sashiko Bow Tie. When it comes to sustainability, fabrics are often times the elephant in the room. They’re all around us but are all too frequently left out of the conversation. We simply overlook fabrics, maybe because we see the end product, the fashion, the design, and not the process by which fabrics are produced. • Water: a finite resource that is quickly becoming scarce is used at every step of the manufacturing process. The water becomes full of chemical additives and is then expelled as wastewater, which in turn pollutes the environment as it is saturated with dyes, bleaches, detergents, optical brighteners, equalizers and many other chemicals used during the process. In 2014, approximately 90.8 million metric tons of textile fibers were produced worldwide in total, of which 63.3 million metric tons were chemical fibers. The trajectory has been rising since 1975 where approximately 23.94 million metric tons of textile fibers were produced, of which 10.64 million metric tons were of chemical origin. The sheer amount of fabric produced each year is an indication of how much fabric has become a necessity in our lives. The United States is the largest importer of garments in the world, and China accounting for 54% of the world’s textile production. As consumers we can no longer overlook the production of fabrics impact on the environment. But what can we do as consumers and designers do, to limit the negative impact? Here are a few guidelines to keep in mind when purchasing clothes, or anything manufactured with fabric. Chemicals that make synthetic fabrics do not decompose. They leach into the environment, leaving an impact on groundwater, wildlife, air and soil, and they also may be absorbed or inhaled directly. Producing synthetic fibers produces air pollutants. Nylon and polyester are made from petrochemicals, whose production creates nitrous oxide, a greenhouse gas that is 310 times more potent than carbon dioxide. Rayon is made from wood pulp that has been treated with chemicals, including caustic soda and sulphuric acid. Dye fixatives used in fabrics often come from heavy metals and pollute water systems. Acrylic fabrics are polycrylonitriles, which may be carcinogenic. Generally speaking, natural fibers have half the carbon footprint of all synthetics. In addition to having a much smaller carbon footprint in production, natural fibers are biodegradable when discarded. Microorganisms can safely break them down and these broken down fibers are easily composted, with all carbon returning to the soil and assisting in regrowth of new plants. Clothing made from natural fibers or discarded textiles can also be recycled into anything from paper, cotton rags or seat cushions, depending on the severity of wear and tear. When unsalvageable, natural fiber clothing is easily composted. Organic fibers are the most heavily regulated. Their carbon footprint is almost always, the most impressive. Only organic guarantees no toxic synthetic pesticides, toxic synthetic herbicides, or chemical NPK fertilizers used in production, and no antibiotics or growth hormones are given to animals. Organic producers and processors are subject to rigorous announced - and unannounced - certification inspections by third-party inspectors to ensure that they are producing and processing organic products. Organic, all-natural fabrics like cotton, wool and linen may be the safest options when it comes to your health. Animal fibers such as silk, wool, cashmere, angora are also more intelligent choices. Substituting organic fibers for conventionally grown fibers is not just a little better but lots better in all respects. A study published by Innovations Agronomiques (2009) found that 43% less GHG (greenhouse gases) are emitted per unit area under organic agriculture than under conventional agriculture. A study done by Dr. David Pimentel of Cornell University found that organic farming systems used just 63% of the energy required by conventional farming systems, largely because of the massive amounts of energy requirements needed to synthesize nitrogen fertilizers. However just because it’s organic doesn’t mean it necessarily has a smaller carbon footprint. This is because it is all contingent on the area of manufacture. In a study from Stockholm Environment Institute, they found that the total energy to produce organic cotton in India was greater than the conventionally, non-organic cotton produced in the USA. The reason is because yields are much less in India, so it takes much more land, employees, transportation and energy to grow the same amount of organic cotton that is grown in places such as the United States. In addition, much of India’s energy is still driven from coal, a nonrenewable resource. Organic is great in any capacity but if you’re going to buy organic, just be mindful of where it’s produced. Think of buying vintage as a form of recycling textiles. By consuming recycled textiles and clothing we reduce our dependency on the production of new fabrics. The fabrics that Faburiq sources are made from methods that have been in existence for hundreds of years, before the time of modern dyes and chemicals. The same labor-intensive ways, free of modern machinery were used to create these designs and fabrics. These methods are still employed today, handed down from previous generations. According to the EPA, every year an estimated 13.1 million tons of textiles are thrown away and of that, only 15% (roughly 2 million tons) are reclaimed for recycling! The remaining 11 million tons of textiles sits to decompose in landfills. Decomposing clothing releases methane, a harmful GHG and a significant contributor to global warming. There are dyes and chemicals in fabric and other components of clothing and shoes that can leach into the soil, contaminating both surface and groundwater. In addition to that, the recycling and waste management process is energy intensive and could very easily double the amount of energy already required to manufacture the fabric in the first place. Fashion is cyclical and recyclable. They will often come back in style, but in a contemporary form. The fabrics that we source are not only classic, they are also timeless. Therefore…be mindful of your fabric choices. Shop Faburiq’s collection of handmade accessories, all made from Heritage, Vintage and Dead-stock fabrics. Kyoto is the traditional industrial and textile hub of Japan. Here, most of Japan's kimonos and obis are woven, dyed and embroidered. In Kyoto, you can see kimonos as part of daily life, as a fashion statement and as an extricable part of the culture, from the performing arts to the myriad ceremonies to local customs. When we visited this city last, we were able to experience the tradition of Kyoto Yuzen or Kyo-Yuzen. Kyo-Yuzen is applied in two styles: Tegaki Yuzen (hand-painted yuzen) and Kata Yuzen (stencil-dyed yuzen). A fan painter in Kyoto named Yuzensai Miyazaki invented the yuzen hand-painted techniques in the Edo period around 1700. With the popularity of his fans, he began to receive commissions from aristocrats to paint kimono fabrics. Yuzensai Miyazaki developed the process to create high quality, dyed fabric whose art would not be ruined by rain, humidity, sweat, sunlight and so on, yet retained the artistic and nuanced qualities of hand painted artwork. Painted yuzen uses a rice-paste resist (a barrier that blocks certain parts of the cloth from being dyed). Learn more about Tokyo Hand-Painted Yuzen. Katazome or stencil dyeing is a dyeing method that uses a stencil to create repeated patterns, either using dye paste or a resist paste. The stencil is usually made of a stiff type of paper infused with persimmon juice, and is washed and reused until it falls apart. Edo Komon and Kata Yuzen are types of Katazome stencil dyeing methods. Kata Yuzen techniques were developed by Jisuke Hirose in Kyoto around 1880. With combinations of stencil, brush and resist techniques, the dye craftsmen created fabric that is its own art form. The characteristic point of Kyo-Yuzen dyeing is to dye complicated patterns with many colors and tonal gradation. And, of course with the dyeing process, fabric can be produced in larger quantity than by just hand painting. After the fabric is dyed it is dried, steamed, washed and dried. The steaming process sets the yuzen dye. Without this labor-intensive process, the product cannot be called yuzen. The color transmission is incredible, resulting in fabrics with impressive and deep colors. The fabric below shows one of our Yuzen kimono patterns - the Indigo Kiku - made into a pocket square. In some ways, kimonos are a centuries-old version of ethical luxury. You can wear them for decades, even if your body shape changes. When they become used, you can make them into a futon, cushion or any creative application. They cycle through seasons, not trends. In that regard alone, the price-performance of kimonos is actually quite high. In the Gumma prefecture, resides the Sadao family, the last living family that carries the tradition of Isezaki-Kasuri weaving. We spent an afternoon with Mr. Sadao as he walked us through the meticulous process of creating this handcrafted fabric. Named after the city of Isezaki itself, Isezaki-Kasuri (Kasuri meaning a splashed pattern) is a plain weave using silk thread also known as Isezaki-Meisen. 平織り: Hira-ori or Plain weave is the simplest and most common of textile weaves. It is also known as the Tabby weave. The filling threads and the warp threads interlace alternately, forming a checkboard pattern. These plain fabrics are woven with pre-dyed silk threads, keeping the characteristics of silk. They are woven manually with various techniques ranging from simple splash patterns to more complicated splash patterns. Silk textiles have been woven here for centuries due to a flourishing silkworm industry. Approximately 250 years ago, the area became busy enough for a city to be established, and textiles were shipped to Edo (now Tokyo) on boats via Tone-gawa River. Although Isezaki owed its growth to textiles, demand for textiles declined drastically as woolen and silk/wool mix kimono fabrics became more popular. Isezaki-Kasuri weaving was designated a traditional craft in 1975. The unassuming entrance of the Isezaki-Kasuri workshop where the fabrics are produced. In Japan, craftsmanship has always been looked upon with great respect. Within the Kimono industry itself, there are a range of techniques and disciplines. One of our visits to heritage Kimono makers during our last trip to Japan was with the Ogura family of Ogura Some-gei, who keeps the tradition of Edo Yuzen living. In observing this family-run, father and son operation, their technique in Kimono crafts is derived from aspects that are "un-changed" or timeless; something that has been done the same way for many many years. But as with many small craft industries, very few craftsmen have been able to pass their skill to next generation. Fortunately, Ogura Teiyu, the father, was able to pass his knowledge and skills to his son, Takashi, which keeps the core of Japanese creation and craftsmanship culture alive. We have been extremely fortunate to have spent some time with them. Yuzen (hand-painted patterns) originated in Kyoto in the late 17th century during the Edo period. It is regarded as the foremost representation of Japanese Kimono design. Today, Kyoto, Kaga (present-day Ishikawa Prefecture) and Tokyo are the three places renowned for Yuzen. Yuzen begin in Tokyo about one century after the art itself had already originated. At that time, Edo (present-day Tokyo) was the center of Samurai politics and the center of the nation's prosperity, after being transferred from Kyoto. Many dyers who worked for the feudal lords moved to "downtown Edo" by the rivers to continue their craftsmanship. There are numerous steps involved in the Yuzen process. Firstly, the fabric that is manufactured elsewhere, usually in Kyoto or Shiga Prefecture, is brought to Tokyo. It is temporarily sewn for fitting and lines for patterns are drawn on it as originally designed. It is then painted in blue ink made from the dayflower called "aobana". These lines will completely disappear when the fabric is washed later. These lines/outlines are then traced with a kind of glue substance made from rice or rubber, so that the dyes will not run into the other areas. Then, colors are placed on the patterns. This is the most important step of the entire process, in which consideration is given to coloring and coordinating the colors that are to be used, and the properties of the dyes. After the pattern painting is completed, the whole blot of material is steamed which improves the color of the fabric and sets the dyed areas. The colored parts are then covered with the "glue substance", so that they are not damaged in the next step. During the next step, the background dye is evenly applied to the whole cloth with a big brush but the “glue substance” preserves the design. After dyeing the background, the fabric is again steamed for about an hour, and then it is washed out. The "glue substance" is completely washed off this time. After the dyeing process is finished, gold and/or silver leaves are often attached to parts of the design and/or some parts of the product are embroided. This finishes off the product before being released for retail. In addition, when "kamon" which means family crest, should appear on the product, the product will go under the process of "monso-uwae”, the process in which the family crest is painted by hand on the finished item. There is a movement amongst consumers that is becoming more drawn to handmade, hand crafted products. At Faburiq, we aim to satify that need by combining two traditional skills to create something extraordinary. Timeworn fabrics from Japan and classical tailoring from the USA; rejuvenated and living harmoniously as the modern man's accessory. At Faburiq, we search Japan for centuries old traditions in fabric making. In our recent trip to Japan, we had the chance and privilege to meet Atsushi Tomita and his son, Takashi Tomita, whose family has been manufacturing Komon kimono fabrics since 1914. Located in the Shinjuku-ku area of Tokyo, their family run factory lies on the upper stream of River Kanda where there is ample supply of neutral river water essential for dye works. Komon means "small repeated patterns" and dyed Komon goes back to the Muromachi period (1333 - 1573) where the samurai class began to use them as daily clothes. In the Edo period (1603 - 1868), Komon was used for kamishimo, the samurai's formal wear. Each samurai family has it's own pattern and the pattern was only unique to one family. As each family competitively created original designs and techniques, dyed Komon eventually developed into a form of craft. Today, Komon dyeing has been adopted into ordinary life. The modern and sophisticated Komon kimono with a 600-year tradition is mostly worn for tea parties and chic casual today. Designing the template and pattern carving. Groups of most skilled pattern-carvers from Ise, modern Mie prefecture, have been specializing in this demanding task for more than a thousand years, probably since the Heian period. Coloring Adjustment and Paste Mixing. Powdered glutinous rice and rice bran are mixed with water to make a soft dough. The dough is steamed and kneaded with the required dye solution until it looks like paste. Dyes are tested carefully on cloths until the right shade is found. "Ji-iro-nori" is the paste for the area outside the pattern and "Me-iro-nori" is the paste for the pattern itself. Katatsuke or Pattern Dyeing. The pattern is placed on a white silk cloth on a long board and the "Me-iro-nori" is spread evenly. The patterned cloth is then dried in the sun. Shigoki or Field Dyeing. When the paste is completely dried, colored paste is spread evenly on the cloth so that it covers the whole cloth. This step is called "Shigoki". Sawdust is sprinkled over the paste-covered cloth to prevent it from adhering to other sheets of cloth. Finishing which involves steaming, washing and drying. Before the coloring paste dries out, the cloth is put into a steam box for 15 to 30 minutes at 90 too 100 degrees Celsius. This process allows the dye contained in the paste to permeate evenly into the cloth. Until 1963, dyed fabric has been washed in the river Kanda. But now, underground water has been used to splash the paste off the cloth with a machine. Lastly, the cloth is spread onto a board to dry, and then smoothed out with steam and iron. The Shinjuku dyers along the River Kanda have played a big part in Tokyo's busy kimono industry since the beginning of Japan's modernization. Tokyo became one of Japan's three main production centers of kimonos, with Kyoto and Kanazawa. In recent years, many tradesmen in the Tokyo dyeing industry have been designated as Masters of Traditional Crafts under Japanese laws for preserving traditional crafts. The visit served as a perfect opportunity to scout for new fabrics and get inspired. Shop culture, shop Faburiq. Wagara literally means Japanese patterns or design. These patterns were created by combining elements of painting and Chinese calligraphy in the Heian Period (795-1185). To this day, there are patterns that are still being created for Wagara. It is a design found only in Japan and is very traditional. There are ten common and basic Wagara designs. Seigaiha (青海波), which is a big wave of the blue ocean; Tatewaku (立涌); Kikkou (亀甲), which is the shell of a turtle, and is a common design representing the intellect and bliss throughout China and Korea; Kagome (籠目); Hishi (菱); Sankuzushi (三崩し); Ten (点); Shima (縞); Uroko (鱗), which is a mixture of equilateral or isosceles triangles; and Ichimatu (市松). Additional designs include Kacho-huugetu (花鳥風月) and Huujin-raijin (風神雷神). We decided to use the Seigaiha (青海波) pattern for Faburiq's packaging. Today’s designers make new Wagara by mixing contemporary patterns with old ones. For example, patterns that resemble nature such as seasonal flowers, pine, bamboo, plum, cherry blossoms, running water, moon, waves, mountains, plants, and creatures like the butterfly, goldfish, crane, and rabbit, are used. There are also some patterns that originate from Sanskrit characters. In the past, the Japanese wore kimono as a form of casual wear. But of late, they no longer wear the kimono, only for formal and special occasions. The kimono industry and makers begin to decline and to bring back it's appeal, they started making other products that incorporated traditional Japanese designs such as bags, pouches, and clothes. The perception of Wagara has since evolved and has notably improved. It was once considered to be old-fashioned but now it is considered unique and elegant. Faburiq strives to retain a lost art that originated from ancient traditions while keeping the need to create modern, wearable and classic designs. If you haven't already noticed, the Chrysanthemum, or Kiku in Japanese, is a recurring flower on many of Faburiq's pieces. Why is this particular flower so prominent on Japanese fabrics? I want to share with you some of the symbolism behind this unique flower that makes up so many of our designs. The Chrysanthemum is a symbol that represents longevity, endurance and integrity. It is the most celebrated of all Japanese fall-flowering plants. It was first introduced to Japan from China as medicine during the Nara period (710 - 793 AC), when the Japanese Royal Family became fascinated with the Chrysanthemum. Eventually it became the Imperial Family's Emblem in the Kamakura period (1192-1333). But it was only in 1869, in the Meiji period (1868-1912) that Kiku with 16 petals was officially adopted as the symbol of the Japanese royal family. There are more than 150 seals or mon featuring this wonderful flower. The Imperial Seal of Japan is the most famous of them. The Imperial Seal of Japan feature 16 petals on the front and 16 petals on the back (only the tip of the petals can be seen on the back). The Japanese government uses the 16 petals seal for official documents such as passports. The Chrysanthemum was also used as symbol of the Throne of the Emperor of Japan. There is also the Supreme Order of the Chrysanthemum – the highest Japanese honor order awarded by the Emperor. We can also find the Chrysanthemum on 50 yen coins, kimono cloths, wallets, bags, and many other accessories in Japan. It is important to notice that white Chrysanthemum is used for funerals and graves in Japan and China. On the other hand, red Chrysanthemums are given to the people you love or, at least, are very fond of. Therefore, be careful with the meaning of each color. Some of our most popular pieces that feature the Chrysanthemum flower are shown below. These pieces are made to be fun or formal but always evoking elegance and beauty. Brooklyn's Straw and Gold Now Carrying Faburiq! Read Faburiq's Interview with Brooklyn's premier online purveyor of handcrafted, quality goods. The word Shibori comes from the Japanese verb root “shiboru” meaning, “to wring, squeeze, press”. Shibori a traditional Japanese resist-dyeing technique that has been around longer than any other fabric dyeing method. It was most popular in the early Edo period when lower class people were forbidden from wearing silk. The pattern is made by binding, stitching, folding, twisting, compressing, dyeing, and then releasing the binding pressure to reveal the pattern. Each method that is used is done with harmony with the type of cloth to create beautiful surface designs. Commonly mistaken for tie-dye in the West, the original Shibori techniques were ancestral, handed down exclusively within Japanese artisan families. There are six major known Shibori techniques: Kanoko, Miura, Kumo, Nui, Arashi and Itajime. Faburiq's accessories are made from fabrics that utilize the Kanoko and Miura techniques. Kanoko Shibori, the most popular variation of the Shibori technique and the closest to the Western Tie-Dye version, involves tying cloth to achieve the desired pattern. Each individual knot is hand-tied, creating small variations in the shapes, and is carefully released by the artisan one at a time. Most common are circular shapes achieved with this technique. Sometimes the circles are places in an irregular fashion to create an image, or more frequently, the fabric is folded into layers to create a repeating pattern. This is a time-consuming, painstaking process with beautiful, monochromatic results. Miura is a technique that involves looping and binding. A hook and needle is used to pluck sections of the cloth and a thread is looped around each section twice, the released pattern resembles water ripples. The final pattern depends on how tightly you bind the fabric and where it is bound, making each pattern unique in itself. This is the easiest of all Shibori techniques and most commonly used. What if, instead of fighting imperfection, you welcomed it in your life? Believe it or not, this is the foundation of a very old way of thinking. The Japanese concept of wabi-sabi means "impermanent, imperfect and incomplete." It derives from the Buddhist way of looking at the world, which has a foundation in nonattachment, and takes its cues from the natural world and authenticity, from the handmade and the worn. Popularized in 15th century Japan, it is a reaction to excess and lavishness. As a designer, I think of it as the anti-internet, and a similar aesthetic is undercurrent in all types of design today. Currently, it's a reaction to the sleek perfection of technology, of the cookie-cutter house or car, the bland design of corporate logos and mass-produced retail goods. Wabi-sabi is the Japanese idea of embracing the imperfect, celebrating the worn, the used or the cracked, both as a decorative and spiritual concept. In essence, it's the acceptance of the toll that life takes on us all. If we can learn to love the things that already exist, for all their chips and cracks, their imperfections, their crooked lines or tactile evidence of being made by someone's hands instead of a machine, from being made of natural materials that vary rather than perfect plastic, we wouldn't need to make new stuff, reducing our consumption, its concurrent energy use and inevitable waste while cutting our budgets. We might also be less stressed, and more attentive to details, which are the keys to mindfulness. At Faburiq, we design knowing our fabrics have an implied history and evidence of humanity. We have an appreciation of the stories old things have, rather than the blankness that new things shine out into the world. We pride ourselves in giving these traditional fabrics a new life by crafting them into accessories and apparel with yet, another story to tell. Faburiq lives by the values of Mottainai - that the old can be made new and everything can be given life again. Faburiq's pieces are fabrics that have been saved and reused, so you can give them another history and chapter in it's life. Thank you to our customers and for giving us the opportunity to serve you. Have a very Happy Thanksgiving 2014! When one thinks of a curated, creative lifestyle encompassing health, well-being and personal style, Betty Riaz embodies all of these. Through her work as a yoga practitioner, her boutique at Stil Studio, and now teaming up with fine jewelry designer, Ana Katarina Vinkler-Petrovic, to curate Boston's newest pop-up store Stil Now, on Boston’s famed Newbury Street. Scouring the globe for unique, handpicked, sustainable and stylish items, Stil Now, with its eclectic mix of designers, is a blueprint for a balanced, international lifestyle. As dear friends, Betty invited me to share Faburiq’s international elegance with Stil Now, and I am honored to have Stil Now carry Faburiq pocket squares. As a huge follower of designers that Stil has previously carried, we're thrilled Stil Now has brought back some of it's old favorites such as Hoss, Nirva, Ottod'Ame and Escentric Molecules. For this holiday season, Stil Now is featuring Balkan designers, notably Ana-Katarina Jewelry, Portmanteau, Amna and Milansenic. A host of designers for men's accessories and home goods such as Beacon Hill Bow Tie Club and Miraggio Pillows are also being featured. The space is just as one would imagine - minimal, serene, foreign but homely, like a living space that has manifested from the streets of Pakistan to the clean cuts and coziness of Copenhagen. If you are in the Boston area be sure to visit Stil Now on Newbury St this Holiday season, and thank you to Betty, Ana-Katarina and the Stil crew so much for carrying Faburiq! Pocket Squares are handy and stylish. Great to dress up any pocket - suit pocket, pant pocket, jean pocket, shirt pocket, even a ladies pocket....get one of these cool kasuri cotton blues to add to your stocking stuffers! Also available now at Stil Now on Newbury Street! Faburiq is now available at STIL NOW on Newbury Street! Faburiq's pocket squares are now available at STIL NOW's pop up store this November and December 2014! Serving both Men's and Women's fashion needs, kick start your holiday shopping with some serious style and get a square at 304 Newbury Street in Boston! The new packaging for Faburiq is here! Seigaiha 青海波 literally means "blue wave of the sea". The double circle patterns resembling ocean waves around the label is not only found on fabrics but on packaging and pottery. This pattern has been used as a clothing motif in Japan for more than a thousand years and also used on ancient Chinese maps to illustrate seawater. The pattern originated from Middle Eastern culture and was introduced to Japan through China around the 11th century. Just as blue ocean waves are the movement and the current of changing tides, such is life itself, always in motion and a journey. For me, the blue color conveys a sense of calmness and tranquility while the waves represents motion. An ideal combination whilst not always easy to accomplish, but is perfect as packaging for something truly special.